A Space elevator that take you to the moon will be available in 2050. 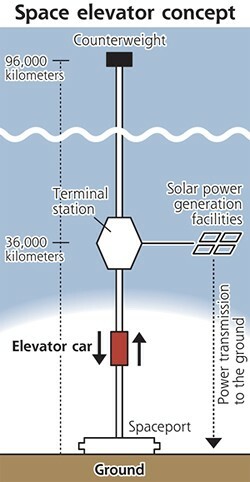 It means in the next 38 years from now it may be possible to travel to the space by using this space elevator. This space elevator concept will be up and running in 2050. Tokyo Based company Obayashi Corp unveiled a project to build a gigantic elevator that would transport passengers to a station 36,000 kilometers above the Earth, they hopes to have a space elevator operational by 2050, carrying passengers and cargo in a vehicle that travels along a ribbon made of carbon nanotubes extending a quarter of the way to the moon. A counterweight at the end of the 96,000 kilometer (59,652 mile) cable would anchor the entire assembly, which is connected to a station on the ground. Passengers would travel from the surface of the Earth to a terminal station housing a research center and residential facilities located about 36,000 kilometers (22,369 miles) up the ribbon in a car traveling at 200 km/h (124 mph). At that speed the journey is anticipated to take about a week. Solar panels at the same elevation as the terminal station would provide its electricity and also send power back to the surface. The concept of elevators reaching into space has been around since 1895 when Russian scientist Konstantin Tsiolkovsky was inspired by the newly built Eiffel Tower to first conceive of the idea of a free-standing tower reaching into geostationary orbit from the Earth's surface. The idea has since become a staple of science fiction, but in recent years conferences have been held on the topic and NASA has also been actively involved in efforts to make them a reality. But finding a material light enough and strong enough to create such a long cable has been a significant obstacle. Obayashi and others believe carbon nanotubes can get the job done, making them the key to the ambitious project. Obayashi is not yet saying how much they estimate the project will cost, but when it's up and running, it hopes to transport 30 passengers at a time along the space cable, perhaps using magnetic linear motors. The company also hasn't revealed a location for the space elevator, but as it relies on centripetal forces to keep the ribbon taut, the base station needs to be located along - or at least close to - the equator.